Bitirme tezimdeki “Genişleyebilir Hesaplama Ortamları ve Apache Spark” isimli bölümü paylaşıyorum. Bitirme tezimdeki “Yapay Öğrenme Nedir?” başlıklı bölümü sizlerle paylaşıyorum. Bu yazıda bilgisayar bilimlerine dair bir teknik bir içerik mevcut değildir. Normal öğrenme ile bilgisayar bilimlerindeki öğrenme (makine öğrenmesi) arasındaki bağ kurulmaya çalışılmıştır. Continue reading Yapay Öğrenme Nedir? I’m developing a complex software. The core part of the software is web service. When the software goes production and if there is a bug in the web service, it is hard to debug. Because Visual Studio executes IISExpress and it prohibits service to remote clients. I tried to solve this problem using Apache reverse proxy. 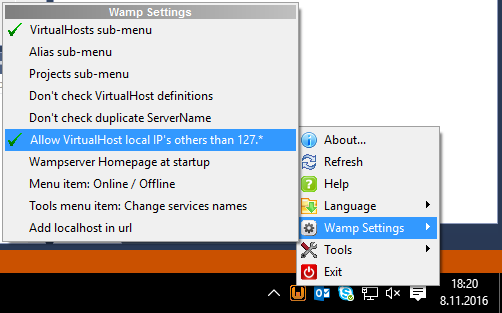 I installed WampServer for Apache. I allowed the remote access. Derleyici tasarımı dersinde dönem projesi olarak yazdığım 1200 satırlık LR0 Parser kodunu ve raporunu paylaşıyorum. In our system, we use linux quota to limit users file usage. However, quota database has inconsistencies with file usage of users. Sometimes user has no data, however quota database shows 4KB of usage. On this problem, quotacheck is recommended. However, quotacheck fully checks the disk. If there are too many files and users, also user files frequently changing; online mode of quotacheck can’t fix inconsistencies. In Computer Communications course, we have been wanted to present a SIGCOMM paper and write a report about it. We choose this paper, Named Data Networking. The paper was a summary of all works done related to Named Data Networking. This is our report. We had limited time to write this paper, I can consider it incomplete. It may have better. It can give more information and give sophisticated point of views about NDN. Regardless, it was a good work about NDN. İnternet üzerinde memristör üzerine Türkçe bir kaç yazı mevcut. Ama sanırım bunu bir bilgisayarcının gözünden ilk defa okuyor olacaksınız. When I using vim, I save the document by absance of mind. But if you are working on production environment, you don’t have any chance to make mistake. I just need to read code. Then I decided to open the file read-only mode. I discovered a program that shows process activities: ProcessActivityView! You can find which files are accessed by a specific process. I will show this program on finding shared photos. I wrote a program for deleting Foldername.exe virus. Must be executed in the virus directory. There must not be exe file on the folder. Open notepad, copy the code into it and save something.bat.